In sports and in competitions of all types, the proverbial three-peat, winning three in a row, is very rare. The South Huntington Water District was recently judged the winner of the Long Island Water Conference’s ‘Best Tasting Water Contest’ in Suffolk County for the third year in a row! 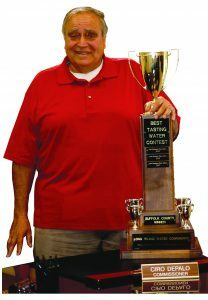 The Best Tasting Water Contest trophy is at the SHWD administration building, 75 Fifth Avenue South, Huntington Station NY. Commissioner DePalo invited the public to stop by and see it. “And we’re going to be going for victory number twelve in next year’s competition!” he added.